Here at Kulturschöpfer, we love to support our neighborhood by playing an active role in community events. When Kulturschöpfer was founded five years ago and the opportunity arose for us to have a stall at Friedrichshain’s yearly street festival, ‘Suppe&Mucke’, we gladly accepted and have done every year since. You may well be wondering what ’Suppe&Mucke’ is all about so let us explain - ’Suppe&Mucke’ directly translates as “Soup&Music”. It’s a colloquial and friendly name which nicely reflects the relaxed, family feel of the event. This year it took place in June and whilst Berlin may not always have reliably hot summer months, the afternoon of Suppe&Mucke was wonderfully warm - both in temperature and atmosphere! Now wait a minute.. Soup on a hot day in June..?! Yes it may sound slightly strange but hear us out and hopefully you’ll understand why we at Kulturschöpfer are great supporters of the event and couldn’t wait to be involved again. 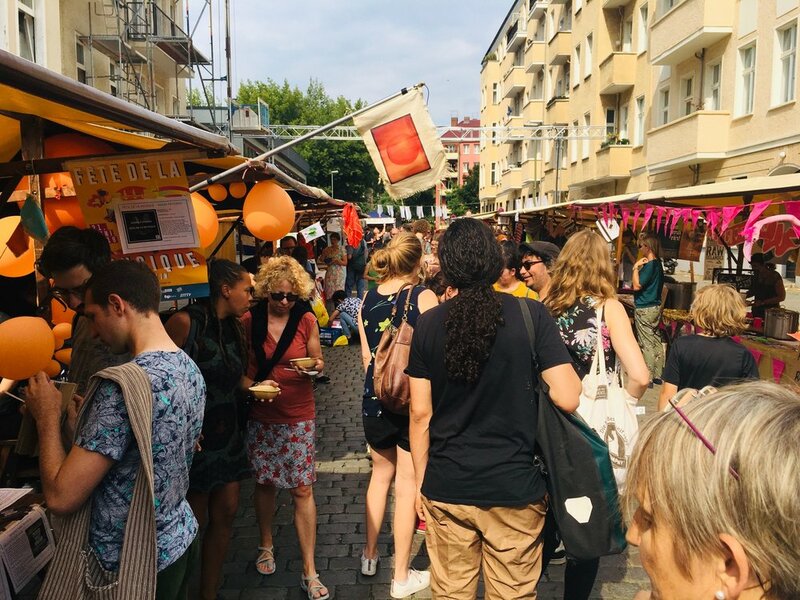 Now on it’s 10th year, Suppe&Mucke is a local street festival which promotes different organisations, associations and initiatives in the neighbourhood of Friedrichshain. By inviting them to have a stall at the event, this provides them with a platform to share their projects, work and activities with the community. Suppe&Mucke also seeks to encourage collaboration between local projects – something that we at Kulturschöpfer are passionate about too. This year over 30 organisations varying from social, to political, to creative, to environmental (the list goes on!) were represented and it was fantastic to see such a variety of people and causes in one place. One of the many things we love about Friedrichshain is its great diversity and the festival displays this so well. Just as on typical day on the streets of Friedrichshain, the crowd for Suppe&Mucke was full of colour and character, with people of all ages and backgrounds turning up to support and enjoy the unique festival. Known for priding themselves on alternative ways of living, favoring local and independent over commercial, it was no surprise that the local population turned up in number to participate in and support the festival. What makes Suppe&Mucke especially unique is its concept whereby each organization cooks a huge pot of soup and serves a portion to visitors passing by as they stop at each stall and hear about the different projects and initiatives. What adds to the laid-back feel is that visitors are invited to bring their own small soup bowl from home which they then simply wash out using the mobile rinsing station at the festival before moving on to taste the next soup. What’s more, it’s all completely free! The soup as well as the Mucke! Given the hot weather we opted for making a fresh, summer Gazpacho which went down a treat and lots of visitors came by the stall twice to get a second portion which we took as a good sign! This also gave us another opportunity to tell them about who we are and what we offer at Kulturschöpfer which was great too. We set up our stall with flyers and information about our workshops and upcoming events it was so encouraging to see how interested people were. Many were keen to find out more and keep up to date with what we do at Kulturschöpfer so they signed up for our newsletter (in fact both sides of the sign up sheet were full by the end of the afternoon!) The lovely Ioana who offers Japanese Bookbinding and Handmade Recycled Paper workshops also gave some interactive demonstrations of how to make a mini notebook out of an A4 sheet of paper. It’s always our desire at Kulturschöpfer to engage, create and inspire and Suppe&Mucke provided the perfect opportunity to apply and see these values in action in our community. It was a successful and enjoyable day all-round and we left feeling thankful for great conversations and interactions with people from the neighborhood and, of course, full of delicious soup!